Last week, members of NCMGMA’s Board of Directors were present for MGMA’s State Leadership Summit in Denver, CO, where NCMGMA was awarded 2nd place in MGMA’s State Participation Award category. NCMGMA will be awarded $2,500 for winning 2nd place. The State Participation award recognizes the efforts of outstanding state MGMA affiliates in promoting the medical practice management profession. Award recipients are chosen based on how well they performed in three main areas of focus: advancement of the profession through ACMPE, advocacy and survey participation. In photo from left to right: Melissa Klingberg; Todd Pittman, CMPE; Lisa Hooks, CMPE; Sandra Jarrett, FACMPE; Jane Lutz; Chad Ghorley; Steve Parker; Leah Paraschiv, CMPE; and Tessa Wolfarth. 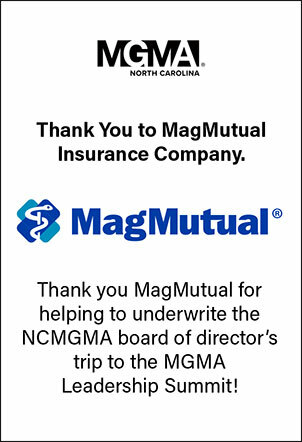 Thank you MagMutual for helping to underwrite the NCMGMA board of director’s trip to the MGMA Leadership Summit! This interview is part of a new collaborative series made possible by Business of Healthcare and the North Carolina Medical Group Management Association. These interviews further our mission to provide high-level content for continuing education for our members while highlighting key players and issues in North Carolina’s healthcare industry. Cardiologist and Tryon Medical Partners CEO Dale Owen, MD, and his 88 physician partners recently separated their practice from a large health system. In a BOH interview available as podcast and video at www.BOHSeries.com, Owen explains why he and his partners made this change, why plans to take on population health risk is critical to physician engagement and how challenging it is to stand up a 75,000-patient practice in weeks. By reading, watching or listening to the full interview, you may self-report to earn 0.5 hours Continuing Education Credits for Certified Medical Practice Executive (CMPE) or Fellow of the American College of Medical Practice Executives (FACMPE) credentials. on independent physician practice possible. BOH was founded as a forum and information exchange for the 40,000 decision makers leading hospitals and health systems, physician practices, pharma, device, and senior living as well as government and commercial payers. These leaders, and innovators serving them, join Business of Healthcare interviews to solve the complex issues they face together. Hosted by Matthew Hanis, each interview balances Margin & Mission: making good healthcare accessible to all. New subscribers come to BOH through your referrals. Please share our content with your colleagues and invite them to join our expert community. Upcoming interviews in the series feature Mandy Cohen, MD, secretary of the North Carolina Department of Health and Human Services; Jeff James, Chief Executive Officer of Wilmington Health; and Chad Price, Founder and Chief Executive Officer of Mako Medical Laboratories. If you are interesting in being interviewed or have a tip on someone who would be a great interview candidate, please contact Melissa Klingberg in the NCMGMA offices at melissa@ncmgm.org. Need help studying? You are not alone. The Tennessee ACMPE Study Group begins the week of July 30th and there’s still time to be a part of this great ACMPE Certification prep resource! The Tennessee ACMPE Study Group is a self-paced online study group through the MGMA Member Community. It’s open to anyone studying for the MGMA Board Certification Exams. Special note: The criteria for board certification are changing. Starting January 1, 2019, a bachelor’s degree or 120 college credit hours will be required to qualify as an applicant for ACMPE Certification, along with two years in a healthcare management position with six months in a supervisory role. To become board certified through the ACMPE, members must meet the qualifications, apply and complete two exams. Examinations may be completed once an applicant has been accepted into the program. The exams can be taken during the same exam cycle or separately, but you must register for each exam individually. These exams can be completed in the order that works for you. If you have any questions, please contact your North Carolina ACMPE Forum Rep, Michelle Wallace Torak, at mtorak@gapgi.com or call MGMA toll-free at 877.275-6462, ext. 1888.